Condo, 2 Bedrooms, 2 Baths, (Sleeps 6). Max. 6 people including all children. Awaiting You at the Sea of Cortez with Beautiful Views of San Carlos and the Tetakawi Peak Across the Bay is a Condominium with Classic Mexican Finishes, Yet All the Modern Conveniences You Are Used to at Home. Unobstructed Views of the Ocean. Custom Mesquite Furniture from Mexico Compliments the Hand-Made Mexican Finishes that Abound in the Condo Including Mesquite Doors and Cabinets, Talavera Tile, and Iron Chandelier. The Fully Stocked, Gourmet Kitchen Will Exceed Your Expectations. All Beds Are Equip with Luxurious Linens. Wireless is Accessible Throughout the Condo. Exit the Living Room Onto a Covered Porch with Seating Area and BBQ. from There, a Lawn Connects Our Condo and the White-Sand Beach. A Short Shell-Hunting Stroll South Brings You to the Protected Estuary Filled with Cranes and a Variety of Underwater Wildlife. A Walk to the North Brings You to Great Food, Beverages, Shopping, Recreational Activities, and Local Life in the Town of San Carlos. 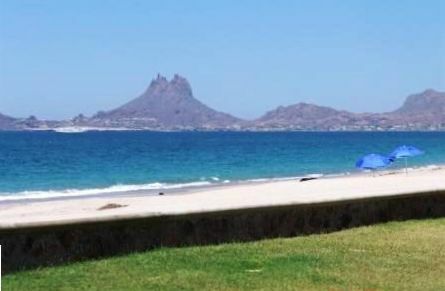 Another Interesting Destination, Just a 10 Minute Drive from the Condo is the Historic Fishing Town of Guaymas (and the International Airport). Don't Miss This Opportunity to Discover that New Special Vacation Spot! If You Need More Room, We Also Have a 3 Bedroom, 2 Story Unit Available that Sleeps 8. Please Contact Us for More Info. Large Butcher Block Island in Kitchen, HD TV, Beach Towels, Beach Chairs, R. O. Water, Beach Umbrellas, Hand-Carved Mesquite Furniture, Custom Plumbing Fixtures, Talavera Tile Throughout. Great place to stay. We come wvery year. There were issues with the condo not being clean when we arrived but the customer service at the condos was excellent and the owner was also quick to answer and the problem was resolved quickly. Outside everything is beautiful but on the inside a lot of things are old. The shower heads had duct tape and one broken. Towels old and very used. Internet nor Tv cable never worked and was never fixed when informed. Then, at the condo: the master bedroom shower was clogged and we had to shower on 3 inches of water that would never go away. The second bedroom has 2 bunk beds...technically to host 4 people...but they were so wabbly that it was dangerous to sleep on the top beds, so our other guest had to sleep on a hard chair in the living room. By the way, all the sofas and chairs are very dirty. It is a lie that he has WI FI: there is none. We had to go and sit outside of the community office to stream WI FI from them. What's worse: we talked with the owner the next morning that we arrived, and told him about all this issues, and he did nothing. We had spoken on the phone prior to your booking and you were advised exactly what charges you would be responsible for. These are not surprise charges or anything that cannot be fully explained/accounted for. As for the maintenance issues, I am a phone call or email away and am more than happy to schedule any kind of maintenance that needs to be done. The maintenance staff is quick to repair routine items such as the showers since they clog with sand from the beach often. We have had zero complaints about the bunkbeds being unsafe and welcome any advice on necessary repairs to keep the condos safe and enjoyable. I am sorry for your sub-par stay and wish you luck in the future! We had a great time in San Carlos. The beach was awesome and the water was warm. The condo was as advertised. Really nice and spacious. Great place to stay, can't wait for next visit. What a beautiful setting and San Carlos is delightful. The condo is a great unit and works really well with kids. We loved the access to the beach, and the wifi was much appreciated! However, we did have a few problems and it caused difficulty with our stay. First, the office had no idea of our reservation, even with the appropriate paperwork we had been asked to bring. The condo was not cleaned until the next morning. Owner gave us a night free for the inconvenience- very appreciated and made up for inconvenience. Worst problem- pool has been under renovation for the last year, according to other condo owners we met throughout our stay. This should have been made clear w/ description of unit and communication with owner. I understand if it had just happened since we booked condo, but this had occurred months before we booked. Family vacation with kids and no pool? Be sure to check reno is complete before expecting a pool! All in all- great vacation, but lack of pool made a huge difference.